20 pins for external connectors on desktops, notebooks, graphics cards, monitors, etc. and 30/20 pins for internal connections between graphics engines and built-in flat panels. 1.62, 2.7, 5.4, or 8.1 Gbit/s data rate per lane; 1, 2, or 4 lanes; (effective total 5.184, 8.64, 17.28, or 25.92 Gbit/s for 4-lane link); 1 Mbit/s or 720 Mbit/s for the auxiliary channel. ^ a b c d e f g h This is the pinout for source-side connector, the sink-side connector pinout will have lanes 0–3 reversed in order; i.e., lane 3 will be on pin 1(n) and 3(p) while lane 0 will be on pin 10(n) and 12(p). ^ a b Pins 13 and 14 may either be directly connected to ground or connected to ground through a pulldown device. DisplayPort was designed to replace VGA, DVI, and FPD-Link. The interface is backward compatible with other interfaces, such as HDMI and DVI, through the use of either active or passive adapters. DisplayPort is the first display interface to rely on packetized data transmission, a form of digital communication found in technologies such as Ethernet, USB, and PCI Express. It permits the use of internal and external display connections, and unlike legacy standards that transmit a clock signal with each output, the DisplayPort protocol is based on small data packets known as micro packets, which can embed the clock signal within the data stream. This allows for higher resolution using fewer pins. The use of data packets also makes DisplayPort extensible, meaning additional features can be added over time without significant changes to the physical interface. DisplayPort can be used to transmit audio and video simultaneously, although each is optional and can be transmitted without the other. The video signal path can range from six to sixteen bits per color channel, and the audio path can have up to eight channels of 24-bit, 192 kHz PCM audio that is uncompressed. A bi-directional, half-duplex auxiliary channel carries device management and device control data for the Main Link, such as VESA EDID, MCCS, and DPMS standards. In addition, the interface is capable of carrying bi-directional USB signals. The DisplayPort uses an LVDS signal protocol that is not compatible with DVI or HDMI. However, dual-mode DisplayPorts are designed to transmit a single-link DVI or HDMI protocol (TMDS) across the interface through the use of an external passive adapter. This adapter enables compatibility mode and converts the signal from 3.3 volts to 5 volts. For analog VGA/YPbPr and dual-link DVI, a powered active adapter is required for compatibility and does not rely on dual mode. Active VGA adapters are powered by the DisplayPort connector directly, while active dual-link DVI adapters typically rely on an external power source such as USB. The first version, 1.0, was approved by VESA on 3 May 2006. Version 1.1 was ratified on 2 April 2007, and version 1.1a was ratified on 11 January 2008. DisplayPort 1.0–1.1a allow a maximum bandwidth of 10.8 Gbit/s (8.64 Gbit/s data rate) over a standard 4-lane main link. DisplayPort cables up to 2 meters in length are required to support the full 10.8 Gbit/s bandwidth. DisplayPort 1.1 allows devices to implement alternative link layers such as fiber optic, allowing a much longer reach between source and display without signal degradation, although alternative implementations are not standardized. It also includes HDCP in addition to DisplayPort Content Protection (DPCP). The DisplayPort 1.1a standard can be downloaded for free from the VESA website. 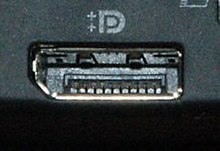 DisplayPort version 1.2 was introduced on 7 January 2010. The most significant improvement of the new version is the doubling of the effective bandwidth to 17.28 Gbit/s in High Bit Rate 2 (HBR2) mode, which allows increased resolutions, higher refresh rates, and greater color depth. Other improvements include multiple independent video streams (daisy-chain connection with multiple monitors) called Multi-Stream Transport, facilities for stereoscopic 3D, increased AUX channel bandwidth (from 1 Mbit/s to 720 Mbit/s), more color spaces including xvYCC, scRGB and Adobe RGB 1998, and Global Time Code (GTC) for sub 1 µs audio/video synchronisation. Also Apple Inc.'s Mini DisplayPort connector, which is much smaller and designed for laptop computers and other small devices, is compatible with the new standard. DisplayPort version 1.2a was released in January 2013 and may optionally include VESA's Adaptive Sync. AMD's FreeSync uses the DisplayPort Adaptive-Sync feature for operation. FreeSync was first demonstrated at CES 2014 on a Toshiba Satellite laptop by making use of the Panel-Self-Refresh (PSR) feature from the Embedded DisplayPort standard, and after a proposal from AMD, VESA later adapted the Panel-Self-Refresh feature for use in standalone displays and added it as an optional feature of the main DisplayPort standard under the name "Adaptive-Sync" in version 1.2a. As it is an optional feature, support for Adaptive-Sync is not required for a display to be DisplayPort 1.2a-compliant. DisplayPort version 1.3 was approved on 15 September 2014. This standard increases overall transmission bandwidth to 32.4 Gbit/s with the new HBR3 mode featuring 8.1 Gbit/s per lane (up from 5.4 Gbit/s with HBR2 in version 1.2), for a total data throughput of 25.92 Gbit/s after factoring in 8b/10b encoding overhead. This bandwidth is enough for a 4K UHD display (3840 × 2160) at 120 Hz with 24 bit/px RGB color, a 5K display (5120 × 2880) at 60 Hz with 30 bit/px RGB color, or an 8K UHD display (7680 × 4320) at 30 Hz with 24 bit/px RGB color. Using Multi-Stream Transport (MST), a DisplayPort port can drive two 4K UHD (3840 × 2160) displays at 60 Hz, or up to four WQXGA (2560 × 1600) displays at 60 Hz with 24 bit/px RGB color. The new standard includes mandatory Dual-mode for DVI and HDMI adapters, implementing the HDMI 2.0 standard and HDCP 2.2 content protection. The Thunderbolt 3 connection standard was originally to include DisplayPort 1.3 capability, but the final release ended up with only version 1.2. The VESA's Adaptive Sync feature in DisplayPort version 1.3 remains an optional part of the specification. DisplayPort version 1.4 was published 1 March 2016. No new transmission modes are defined, so HBR3 (32.4 Gbit/s) as introduced in version 1.3 still remains as the highest available mode. DisplayPort 1.4 adds support for Display Stream Compression 1.2 (DSC), Forward Error Correction, HDR10 metadata defined in CTA-861.3, including static and dynamic metadata and the Rec. 2020 color space, for HDMI interoperability, and extends the maximum number of inline audio channels to 32. DSC is a "visually lossless" encoding technique with up to a 3:1 compression ratio. Using DSC with HBR3 transmission rates, DisplayPort 1.4 can support 8K UHD (7680 × 4320) at 60 Hz with 30 bit/px RGB color and HDR, or 4K UHD (3840 × 2160) at 120 Hz with 30 bit/px RGB color and HDR. 4K at 60 Hz with 30 bit/px RGB color and HDR can be achieved without the need for DSC. On displays which do not support DSC, the maximum limits are unchanged from DisplayPort 1.3 (4K 120 Hz, 5K 60 Hz, 8K 30 Hz). DisplayPort version 1.4a was published in April 2018. VESA made no official announcement or press release, and no details of the changes in version 1.4a have been made public. According to a roadmap published by VESA in September 2016, a new version of DisplayPort was intended to be launched in "early 2017". It would have improved the link rate from 8.1 to 10.0 Gbit/s, a 24% increase. This would have increased the total bandwidth from 32.4 Gbit/s to 40.0 Gbit/s. It is unclear whether or not the new version would have continued using the 8b/10b scheme for transport encoding like previous versions, but if so, the maximum data rate for video would have been 32.0 Gbit/s. However, no new version was released in 2017, likely delayed to make further improvements after the HDMI Forum announced in January 2017 that their next standard (HDMI 2.1) would offer up to 48 Gbit/s of bandwidth. According to a press release on 3 January 2018, "VESA is also currently engaged with its members in the development of the next DisplayPort standard generation, with plans to increase the data rate enabled by DisplayPort by two-fold and beyond. VESA plans to publish this update within the next 18 months." This implies a bandwidth of around 64.8 Gbit/s for the next version of DisplayPort. Assuming 8b/10b encoding, this would give a data rate of 51.84 Gbit/s. Higher resolutions/refresh rates should also be possible through the use of DSC (compression) or chroma subsampling (Y′CBCR 4:2:2 or 4:2:0). Higher uncompressed formats may also be possible if the new version replaces 8b/10b encoding with a more efficient encoding method. At CES 2019, VESA announced that the new version (allegedly to be named "DisplayPort 2.0" according to a Forbes.com contributor) would indeed support 8K @ 60 Hz without compression and was expected to be released in the first half of 2019. ^ Total bandwidth (the number of binary digits transmitted per second) is equal to the bandwidth per lane of the highest supported transmission mode multiplied by the number of lanes. ^ While the total bandwidth represents the number of physical bits transmitted across the interface, not all of the bits represent video data. Some of the transmitted bits are used for encoding purposes, so the rate at which video data can be transmitted across the DisplayPort interface is only a portion of the total bandwidth. ^ The 8b/10b encoding scheme uses 10 bits of bandwidth to send 8 bits of data, so only 80% of the bandwidth is available for data throughput. The extra 2 bits are used for DC balancing (ensuring a roughly equal number of 1s and 0s). They consume bandwidth, but do not represent any data. The bandwidth represents the rates at which signals representing 1s or 0s are physically transmitted across the interface on each lane. Since the DisplayPort main link uses 8b/10b encoding, only 8 out of every 10 transmitted bits represent data; the extra two bits are used for DC balancing (ensuring a roughly equal number of 1s and 0s). The transmission speeds are also sometimes expressed in terms of the "Link Symbol Rate", which is the rate at which these 8b/10b-encoded symbols are transmitted (i.e. the rate at which groups of 10 bits are transmitted, 8 of which represent data). The DisplayPort AUX channel is a half-duplex bidirectional data channel used for miscellaneous additional data beyond video and audio (such as I2C or CEC commands)(§2.4) at the device manufacturer's discretion. AUX signals are transmitted across a dedicated set of twisted-pair wires. DisplayPort 1.0 specified Manchester encoding with a 2 Mbaud signal rate (1 Mbit/s data rate). (§3.4) DisplayPort 1.2 introduced a second transmission mode called FAUX (Fast AUX), which operates at 720 Mbaud with 8b/10b encoding (576 Mbit/s data rate). (§3.4) This can be used to implement additional transport protocols such as USB 2.0 (480 Mbit/s) without the need for an additional cable, but has seen little practical use as of 2018. All DisplayPort cables are compatible with all DisplayPort devices, regardless of the version of each device or the cable certification level. All features of DisplayPort will function across any DisplayPort cable. DisplayPort does not have multiple cable designs; all DP cables have the same basic layout and wiring, and will support any feature including audio, daisy-chaining, G-Sync/FreeSync, HDR, and DSC. DisplayPort cables differ in their transmission speed support. DisplayPort specifies four different transmission modes (RBR, HBR, HBR2, and HBR3) which support progressively higher bandwidths. Not all DisplayPort cables are capable of all four transmission modes. VESA offers certifications for each level of bandwidth. These certifications are optional, and not all DisplayPort cables are certified by VESA. Cables with limited transmission speed are still compatible with all DisplayPort devices, but may place limits on the maximum resolution or refresh rate available. DisplayPort cables are not classified by "version". Although cables are commonly labeled with version numbers, with HBR2 cables advertised as "DisplayPort 1.2 cables" for example, this notation is not permitted by VESA. The use of version numbers with cables can seem to imply that a DisplayPort 1.4 display requires a "DisplayPort 1.4 cable", or that features introduced in DP 1.4 such as HDR or DSC will not function with older "DP 1.2 cables", when in reality neither of these are true. DisplayPort cables are classified only by their bandwidth certification level (RBR, HBR, HBR2, HBR3), if they have been certified at all. The DP8K certification was announced by VESA in January 2018, and certifies cables for proper operation at HBR3 speeds (8.1 Gbit/s per lane, 32.4 Gbit/s total). It should also be noted that the use of Display Stream Compression (DSC), introduced in DisplayPort 1.4, greatly reduces the bandwidth requirements for the cable. Formats which would normally be beyond the limits of DisplayPort 1.4, such as 4K (3840 × 2160) at 144 Hz 8 bpc RGB/4:4:4 (31.4 Gbit/s data rate when uncompressed), can only be implemented by using DSC. This would reduce the physical bandwidth requirements by 2–3x, placing it well within the capabilities of an HBR2-rated cable. This exemplifies why DisplayPort cables are not classified by "version"; although DSC was introduced in version 1.4, this does not mean it needs a so-called "DP 1.4 cable" (an HBR3-rated cable) to function. HBR3 cables are only required for applications which exceed HBR2-level bandwidth, not simply any application involving DisplayPort 1.4. If DSC is used to reduce the bandwidth requirements to HBR2 levels, then an HBR2-rated cable will be sufficient. The DisplayPort standard does not specify any maximum length for cables, though the DisplayPort 1.2 standard does set a minimum requirement that all cables up to 2 meters in length must support HBR2 speeds (21.6 Gbit/s), and all cables of any length must support RBR speeds (6.48 Gbit/s). (§5.7.1, §4.1) Cables greater than 2 meters may or may not support HBR/HBR2 speeds, and cables of any length may or may not support HBR3 speeds. DisplayPort cables and ports may have either a "full-size" connector or a "mini" connector. These connectors differ only in physical shape—the capabilities of DisplayPort are the same regardless of which connector is used. Using a Mini DisplayPort connector does not affect performance or feature support of the connection. The Mini DisplayPort connector was developed by Apple for use in their computer products. It was first announced in October 2008 for use in the new MacBook Pro, MacBook Air, and Cinema Display. In 2009, VESA adopted it as an official standard, and in 2010 the specification was merged into the main DisplayPort standard with the release of DisplayPort 1.2. Apple freely licenses the specification to VESA. Pin 20 on the DisplayPort connector, called DP_PWR, provides 3.3 V (±10%) DC power at up to 500 mA (minimum power delivery of 1.5 W). (§3.2) This power is available from all DisplayPort receptacles, on both source and display devices. DP_PWR is intended to provide power for adapters, amplified cables, and similar devices, so that a separate power cable is not necessary. Recently VESA has experienced quite a few complaints regarding troublesome DisplayPort operation that ended up being caused by improperly made DisplayPort cables. These "bad" DisplayPort cables are generally limited to non-DisplayPort certified cables, or off-brand cables. To further investigate this trend in the DisplayPort cable market, VESA purchased a number of non-certified, off-brand cables and found that an alarmingly high number of these were configured improperly and would likely not support all system configurations. None of these cables would have passed the DisplayPort certification test, moreover some of these cables could potentially damage a PC, laptop, or monitor. The stipulation that the DP_PWR wire be omitted from standard DisplayPort cables was not present in the DisplayPort 1.0 standard. However, DisplayPort products (and cables) did not begin to appear on the market until 2008, long after version 1.0 had been replaced by version 1.1. The DisplayPort 1.0 standard was never implemented in commercial products. HBR3 was introduced in version 1.3, and is still the highest mode as of version 1.4a. However, transmission mode support is not necessarily dictated by a device's claimed "DisplayPort version number". For example, older versions of the DisplayPort Marketing Guidelines allowed a device to be labeled as "DisplayPort 1.2" if it supported the MST feature, even if it didn't support the HBR2 transmission mode. (p9) Newer versions of the guidelines have removed this clause, and currently (as of the June 2018 revision) there are no guidelines on the usage of DisplayPort version numbers in products. DisplayPort "version numbers" are therefore not a reliable indication of what transmission speeds a device can support. In addition, individual devices may have their own arbitrary limitations beyond transmission speed. For example, NVIDIA Kepler GK104 GPUs (such as the GeForce GTX 680 and 770) support "DisplayPort 1.2" with the HBR2 transmission mode, but are limited to 540 Mpx/s, only ​3⁄4 of the maximum possible with HBR2. Consequently, certain devices may have limitations that differ from those listed in the following tables. Color depth of 8 bpc (24 bit/px or 16.7 million colors) is assumed for all formats in these tables. This is the standard color depth used on most computer displays. Note that some operating systems refer to this as "32-bit" color depth—this is the same as 24-bit color depth. The 8 extra bits are for alpha channel information, which is only present in software. At the transmission stage, this information has already been incorporated into the primary color channels, so the actual video data transmitted across the cable only contains 24 bits per pixel. ^ Only a portion of DisplayPort's bandwidth is used for carrying video data. DisplayPort uses 8b/10b encoding, which means that 80% of the bits transmitted across the link represent data, and the other 20% are used for encoding purposes. The maximum bandwidth of DisplayPort (6.48, 10.8, 21.6, or 32.4 Gbit/s) therefore transports video data at a rate of 5.184, 8.64, 17.28, or 25.92 Gbit/s. ^ These data rates are for uncompressed 8 bpc (24 bit/px) color depth with RGB or YCBCR 4:4:4 color format and CVT-R2 timing. Uncompressed data rate for RGB video in bits per second is calculated as bits per pixel × pixels per frame × frames per second. Pixels per frame includes blanking intervals as defined by CVT-R2. ^ This format can only be achieved with full RGB color if DSC (display stream compression) is used. Color depth of 10 bpc (30 bit/px or 1.07 billion colors) is assumed for all formats in these tables. This color depth is a requirement for various common HDR standards, such as HDR10. It requires 25% more bandwidth than standard 8 bpc video. HDR extensions were defined in version 1.4 of the DisplayPort standard. Some displays support these HDR extensions, but may only implement HBR2 transmission mode if the extra bandwidth of HBR3 is unnecessary (for example, on 4K 60 Hz HDR displays). Since there is no definition of what constitutes a "DisplayPort 1.4" device, some manufacturers may choose to label these as "DP 1.2" devices despite their support for DP 1.4 HDR extensions. As a result, DisplayPort "version numbers" should not be used as an indicator of HDR support. ^ These data rates are for uncompressed 10 bpc (30 bit/px) color depth with RGB or YCBCR 4:4:4 color format and CVT-R2 timing. Uncompressed data rate for RGB video in bits per second is calculated as bits per pixel × pixels per frame × frames per second. Pixels per frame includes blanking intervals as defined by CVT-R2. DisplayPort Dual-Mode (DP++), also called Dual-Mode DisplayPort, is a standard which allows DisplayPort sources to use simple passive adapters to connect to HDMI or DVI displays. Dual-mode is an optional feature, so not all DisplayPort sources necessarily support DVI/HDMI passive adapters, though in practice nearly all devices do. Officially, the "DP++" logo should be used to indicate a DP port that supports dual-mode, but most modern devices do not use the logo. Devices which implement dual-mode will detect that a DVI or HDMI adapter is attached, and send DVI/HDMI TMDS signals instead of DisplayPort signals. The original DisplayPort Dual-Mode standard (version 1.0), used in DisplayPort 1.1 devices, only supported TMDS clock speeds of up to 165 MHz (4.95 Gbit/s bandwidth). This is equivalent to HDMI 1.2, and is sufficient for up to 1920 × 1080 or 1920 × 1200 at 60 Hz. In 2013, VESA released the Dual-Mode 1.1 standard, which added support for up to a 300 MHz TMDS clock (9.00 Gbit/s bandwidth), and is used in newer DisplayPort 1.2 devices. This is slightly less than the 340 MHz maximum of HDMI 1.4, and is sufficient for up to 1920 × 1080 at 120 Hz, 2560 × 1440 at 60 Hz, or 3840 × 2160 at 30 Hz. Older adapters, which were only capable of the 165 MHz speed, were retroactively termed "Type 1" adapters, with the new 300 MHz adapters being called "Type 2". With the release of the DisplayPort 1.3 standard, VESA added dual-mode support for up to a 600 MHz TMDS clock (18.00 Gbit/s bandwidth), the full bandwidth of HDMI 2.0. This is sufficient for 1920 × 1080 at 240 Hz, 2560 × 1440 at 144 Hz, or 3840 × 2160 at 60 Hz. However, no passive adapters capable of the 600 MHz dual-mode speed have been produced as of 2018. Picture of a DisplayPort to DVI adapter after removing its enclosure. The chip on the board converts the voltage levels generated by the dual-mode DisplayPort device to be compatible with a DVI monitor. Limited adapter speed – Although the pinout and digital signal values transmitted by the DP port are identical to a native DVI/HDMI source, the signals are transmitted at DisplayPort's native voltage (3.3 V) instead of the 5 V used by DVI and HDMI. As a result, dual-mode adapters must contain a level-shifter circuit which changes the voltage. The presence of this circuit places a limit on how quickly the adapter can operate, and therefore newer adapters are required for each higher speed added to the standard. Unidirectional – Although the dual-mode standard specifies a method for DisplayPort sources to output DVI/HDMI signals using simple passive adapters, there is no counterpart standard to give DisplayPort displays the ability to receive DVI/HDMI input signals through passive adapters. As a result, DisplayPort displays can only receive native DisplayPort signals; any DVI or HDMI input signals must be converted to the DisplayPort format with an active conversion device. DVI and HDMI sources cannot be connected to DisplayPort displays using passive adapters. Single-link DVI only – Since DisplayPort dual-mode operates by using the pins of the DisplayPort connector to send DVI/HDMI signals, the 20-pin DisplayPort connector can only produce a single-link DVI signal (which uses 19 pins). 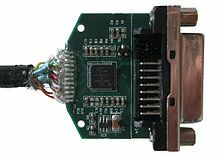 A dual-link DVI signal uses 25 pins, and is therefore impossible to transmit natively from a DisplayPort connector through a passive adapter. Dual-link DVI signals can only be produced by converting from native DisplayPort output signals with an active conversion device. Unavailable on USB-C – The DisplayPort Alternate Mode specification for sending DisplayPort signals over a USB-C cable does not include support for the dual-mode protocol. As a result, DP-to-DVI and DP-to-HDMI passive adapters do not function when chained from a USB-C to DP adapter. Multi-Stream Transport is a feature first introduced in the DisplayPort 1.2 standard. It allows multiple independent displays to be driven from a single DP port on the source devices by multiplexing several video streams into a single stream and sending it to a branch device, which demultiplexes the signal into the original streams. Branch devices are commonly found in the form of an MST hub, which plugs into a single DP input port and provides multiple outputs, but it can also be implemented on a display internally to provide a DP output port for daisy-chaining, effectively embedding a 2-port MST hub inside the display.(Fig. 2-59). Theoretically, up to 63 displays can be supported,(p20) but the combined data rate requirements of all the displays cannot exceed the limits of a single DP port (17.28 Gbit/s for a DP 1.2 port, or 25.92 Gbit/s for a DP 1.3/1.4 port). In addition, the maximum number of links between the source and any device (i.e. the maximum length of a daisy-chain) is 7,(§2.5.2), and the maximum number of physical output ports on each branch device (such as a hub) is 7. (§2.5.1) With the release of MST, standard single-display operation has been retroactively named "SST" mode (Single-Stream Transport). The host system's software also needs to support MST for hubs or daisy-chains to work. While Microsoft Windows environments have full support for it, Apple operating systems currently do not support MST hubs or DisplayPort daisy-chaining as of macOS 10.13 ("High Sierra"). DisplayPort-to-DVI and DisplayPort-to-HDMI adapters/cables may or may not function from an MST output port; support for this depends on the specific device. MST is supported by USB Type-C DisplayPort Alternate Mode, so standard DisplayPort daisy-chains and MST hubs do function from Type-C sources with a simple Type-C to DisplayPort adapter. Support for HDR video was introduced in DisplayPort 1.4. It implements the CTA 861.3 standard for transport of static HDR metadata in EDID. DisplayPort 1.3 added support for HDCP 2.2, which is also used by HDMI 2.0. MPEG LA is making claims that DisplayPort implementation requires a license and a royalty payment. It is important to note that these are only CLAIMS. Whether these CLAIMS are relevant will likely be decided in a US court. As of October 2017 there still seems to be no royalty, according to the VESA's official FAQ. While the standard may not require any per-device royalty fees, VESA requires membership for access to said standards. The minimum cost is presently $5,000. In December 2010, several computer vendors and display makers including Intel, AMD, Dell, Lenovo, Samsung and LG announced they would begin phasing out FPD-Link, VGA, and DVI-I over the next few years, replacing them with DisplayPort and HDMI. One notable exception to the list of manufacturers is Nvidia, who has yet[when?] to announce any plans regarding future implementation of legacy interfaces. DisplayPort has several advantages over VGA, DVI, and FPD-Link. Can be used for transmitting bi-directional USB, touch-panel data, CEC, etc. Although DisplayPort has much of the same functionality as HDMI, it is a complementary connection used in different scenarios. A dual-mode DisplayPort port can emit an HDMI signal via a passive adapter. HDMI charges an annual fee of US$10,000 to each high-volume manufacturer and a per-unit royalty rate of US$0.04 to US$0.15. HDMI Licensing countered the "royalty-free" claim by pointing out that the DisplayPort specification states that companies can charge a royalty rate for DisplayPort implementation. DisplayPort 1.2 has more bandwidth at 21.6 Gbit/s (17.28 Gbit/s with overhead removed) as opposed to HDMI 2.0's 18 Gbit/s (14.4 Gbit/s with overhead removed). DisplayPort 1.3 raises that to 32.4 Gbit/s (25.92 Gbit/s with overhead removed), and HDMI 2.1 raises that up to 48 Gbit/s (42.67 Gbit/s with overhead removed), adding an additional TMDS link in place of clock lane. DisplayPort also has the ability to share this bandwidth with multiple streams of audio and video to separate devices. HDMI uses unique Vendor-Specific Block structure, which allows for features such as additional color spaces. However, these features can be defined by CEA EDID extensions. The specification for DisplayPort Alternate Mode over Type-C was published in 2014; PC, Mac and Chromebook products implementing it started releasing in 2015 and as of 2018 many are available. The specification for HDMI Alternate Mode over Type-C was announced two years later at the end of 2016. Connecting a DisplayPort monitor to a capable Type-C port requires only a "pass-through" adapter. HDMI adapters for the same computers require a signal conversion from DisplayPort to HDMI signal. Figures from IDC show that 5.1% of commercial desktops and 2.1% of commercial notebooks released in 2009 featured DisplayPort. The main factor behind this is the phase-out of VGA, and that both Intel and AMD will also stop building products with FPD-Link by 2013. Nearly 70% of LCD monitors sold in August 2014 in the US, UK, Germany, Japan, and China were equipped with HDMI/DisplayPort technology, up 7.5% on the year, according to Digitimes Research. DisplayPort is expected to surpass HDMI in 2019. Mini DisplayPort (mDP) is a standard announced by Apple in the fourth quarter of 2008. Shortly after announcing Mini DisplayPort, Apple announced that it would license the connector technology with no fee. The following year, in early 2009, VESA announced that Mini DisplayPort would be included in the upcoming DisplayPort 1.2 specification. On 24 February 2011, Apple and Intel announced Thunderbolt, a successor to Mini DisplayPort which adds support for PCI Express data connections while maintaining backwards compatibility with Mini DisplayPort based peripherals. Micro DisplayPort would have targeted systems that need ultra-compact connectors, such as phones, tablets and ultra-portable notebook computers. This standard would have been physically smaller than the currently available Mini DisplayPort connectors. The standard was expected to be released by Q2 2014. This project seems aborted to be replaced by DisplayPort Alt Mode for USB Type-C Standard. Direct Drive Monitor (DDM) 1.0 standard was approved in December 2008. It allows for controller-less monitors where the display panel is directly driven by the DisplayPort signal, although the available resolutions and color depth are limited to two-lane operation. Display Stream Compression (DSC) is a VESA-developed low-latency compression algorithm to overcome the limitations posed by sending high-resolution video over physical media of limited bandwidth. It is a visually lossless low-latency algorithm based on delta PCM coding and YCoCg-R color space; it allows increased resolutions and color depths and reduced power consumption. DSC has been tested to meet the requirements of ISO/IEC 29170-2 Evaluation procedure for nearly lossless coding using various test patterns, noise, subpixel-rendered text (ClearType), UI captures, and photo and video images. DSC version 1.0 was released on 10 March 2014, but was soon deprecated by DSC version 1.1 released on 1 August 2014. The DSC standard supports up to 3:1 compression ratio with constant or variable bit rate, 4:4:4 chroma subsampling, optional 4:2:2 conversion and 6/8/10/12 bits per color component. DSC version 1.2 was released on 27 January 2016 and is included with DisplayPort 1.4; version 1.2a was released on 18 January 2017. The update includes native encoding of 4:2:2 and 4:2:0 formats in pixel containers, 14/16 bits per color, and minor modifications to the encoding algorithm. DSC compression works on a horizontal line of pixels encoded using groups of three consecutive pixels for native 4:4:4 and simple 4:2:2 formats, or six pixels (three compressed containers) for native 4:2:2 and 4:2:0 formats. If RGB encoding is used, it is first converted to reversible YCgCo. Simple conversion from 4:2:2 to 4:4:4 can add missing chroma samples by interpolating neighboring pixels. Each luma component is coded separately using three independent substreams (four substreams in native 4:2:2 mode). Prediction step is performed using one of the three modes: modified median adaptive coding (MMAP) algorithm similar to the one used by JPEG-LS, block prediction (optional for decoders due to high computational complexity, negotiated at DSC handshake), and midpoint prediction. Bit rate control algorithm tracks color flatness and buffer fullness to adjust the quantization bit depth for a pixel group in a way that minimizes compression artifacts while staying within the bitrate limits. Repeating recent pixels can be stored in 32-entry Indexed Color History (ICH) buffer, which can be referenced directly by each group in a slice; this improves compression quality of computer-generated images. Alternatively, prediction residuals are computed and encoded with entropy coding algorithm based on delta size unit-variable length coding (DSU-VLC). Encoded pixel groups are then combined into slices of various height and width; common combinations include 100% or 25% picture width, and 8-, 32-, or 108-line height. On 4 January 2017, HDMI 2.1 was announced which supports up to 10K resolution and uses DSC 1.2 for video that is higher than 8K resolution with 4:2:0 chroma subsampling. Embedded DisplayPort (eDP) 1.0 standard was adopted in December 2008. It aims to define a standardized display panel interface for internal connections; e.g., graphics cards to notebook display panels. It has advanced power-saving features including seamless refresh rate switching. Version 1.1 was approved in October 2009 followed by version 1.1a in November 2009. Version 1.2 was approved in May 2010 and includes DisplayPort 1.2 data rates, 120 Hz sequential color monitors, and a new display panel control protocol that works through the AUX channel. Version 1.3 was published in February 2011; it includes a new Panel Self-Refresh (PSR) feature developed to save system power and further extend battery life in portable PC systems. PSR mode allows GPU to enter power saving state in between frame updates by including framebuffer memory in the display panel controller. Version 1.4 was released in February 2013; it reduces power consumption with partial-frame updates in PSR mode, regional backlight control, lower interface voltage, and additional link rates; the auxiliary channel supports multi-touch panel data to accommodate different form factors. Version 1.4a was published in February 2015; it is based on DisplayPort 1.3 and supports HBR3 data rate, Display Stream Compression 1.1, Segmented Panel Displays, and partial updates for Panel Self-Refresh. Version 1.4b was published in October 2015; its protocol refinements and clarifications are intended to enable adoption of eDP 1.4 in production by mid-2016. Internal DisplayPort (iDP) 1.0 was approved in April 2010. The iDP standard defines an internal link between a digital TV system on a chip controller and the display panel's timing controller. It aims to replace currently used internal FPD-Link lanes with DisplayPort connection. iDP features unique physical interface and protocols, which are not directly compatible with DisplayPort and are not applicable to external connection, however they enable very high resolution and refresh rates while providing simplicity and extensibility. iDP features non-variable 2.7 GHz clock and is nominally rated at 3.24 Gbit/s data rate per lane, with up to sixteen lanes in a bank, resulting in six-fold decrease in wiring requirements over FPD-Link for a 1080p24 signal; other data rates are also possible. iDP was built with simplicity in mind and it doesn't have AUX channel, content protection, or multiple streams; however it does have frame sequential and line interleaved stereo 3D. Portable Digital Media Interface (PDMI) is an interconnection between docking stations/display devices and portable media players, which includes 2-lane DisplayPort v1.1a connection. It has been ratified in February 2010 as ANSI/CEA-2017-A. Wireless DisplayPort (wDP) enables DisplayPort 1.2 bandwidth and feature set for cable-free applications operating in 60 GHz radio band; it was announced on November 2010 by WiGig Alliance and VESA as a cooperative effort. 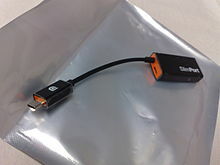 SlimPort, a brand of Analogix products, complies with Mobility DisplayPort, also known as MyDP, which is an industry standard for a mobile audio/video Interface, providing connectivity from mobile devices to external displays and HDTVs. SlimPort implements the transmission of video up to 4K-UltraHD and up to eight channels of audio over the micro-USB connector to an external converter accessory or display device. SlimPort products support seamless connectivity to DisplayPort, HDMI and VGA displays. The MyDP standard was released in June 2012, and the first product to use SlimPort was Google's Nexus 4 smartphone. SlimPort is an alternative to Mobile High-Definition Link (MHL). DisplayID is designed to replace the E-EDID standard. DisplayID features variable-length structures which encompass all existing EDID extensions as well as new extensions for 3D displays and embedded displays. The latest version 1.3 (announced on 23 September 2013) adds enhanced support for tiled display topologies; it allows better identification of multiple video streams, and reports bezel size and locations. As of December 2013, many current 4K displays use a tiled topology, but lack a standard way to report to the video source which tile is left and which is right. These early 4K displays, for manufacturing reasons, typically use two 1920×2160 panels laminated together and are currently generally treated as multiple-monitor setups. DisplayID 1.3 also allows 8K display discovery, and has applications in stereo 3D, where multiple video streams are used. DockPort, formerly known as Lightning Bolt, is an extension to DisplayPort to include USB 3.0 data as well as power for charging portable devices from attached external displays. Originally developed by AMD and Texas Instruments, it has been announced as a VESA specification in 2014. On 22 September 2014, VESA published the DisplayPort Alternate Mode on USB Type-C Connector Standard, a specification on how to send DisplayPort signals over the newly released USB-C connector. One, two or all four of the differential pairs that USB uses for the SuperSpeed bus can be configured dynamically to be used for DisplayPort lanes. In the first two cases, the connector still can carry a full SuperSpeed signal; in the latter case, at least a non-SuperSpeed signal is available. The DisplayPort AUX channel is also supported over the two sideband signals over the same connection; furthermore, USB Power Delivery according to the newly expanded USB-PD 2.0 specification is possible at the same time. This makes the Type-C connector a strict superset of the use-cases envisioned for DockPort, SlimPort, Mini and Micro DisplayPort. Since its introduction in 2006, DisplayPort has gained popularity within the computer industry and is featured on many graphic cards, displays, and notebook computers. Dell was the first company to introduce a consumer product with a DisplayPort connector, the Dell UltraSharp 3008WFP, which was released in January 2008. Soon after, AMD and Nvidia released products to support the technology. AMD included support in the Radeon HD 3000 series of graphics cards, while Nvidia first introduced support in the GeForce 9 series starting with the GeForce 9600 GT. Later the same year, Apple introduced several products featuring a Mini DisplayPort. The new connector – proprietary at the time – eventually became part of the DisplayPort standard, however Apple reserves the right to void the license should the licensee "commence an action for patent infringement against Apple". In 2009, AMD followed suit with their Radeon HD 5000 Series of graphics cards, which featured the Mini DisplayPort on the Eyefinity versions in the series. Nvidia launched NVS 810 with 8 Mini DisplayPort outputs on a single card on 4 November 2015. Nvidia revealed the GeForce GTX 1080, the world's first graphics card with DisplayPort 1.4 support on 6 May 2016. AMD followed with the Radeon RX 480 to support Displayport 1.3/1.4 on 29 June 2016. The Radeon RX 400 Series will support DisplayPort 1.3 HBR and HDR10, dropping the DVI connector(s) in the reference board design. In February 2017, VESA and Qualcomm announced that DisplayPort Alt Mode video transport will be integrated into the Snapdragon 835 mobile chipset, which powers smartphones, VR/AR head-mounted displays, IP cameras, tablets and mobile PCs. ^ Dual-link DVI is limited in resolution and speed by the quality and therefore the bandwidth of the DVI cable, the quality of the transmitter, and the quality of the receiver; can only drive one monitor at a time; and cannot send audio data. HDMI 1.3 and 1.4 are limited to effectively 8.16 Gbit/s or 340 MHz (though actual devices are limited to 225–300?MHz), and can only drive one monitor at a time. VGA connectors have no defined maximum resolution or speed, but their analog nature limits their bandwidth, though can provide long cabling only limited by appropriate shielding. ^ a b c "DisplayPort Technical Overview" (PDF). VESA.org. 10 January 2011. Retrieved 23 January 2012. ^ "AMD's Eyefinity Technology Explained". Tom’s Hardware. 28 February 2010. Retrieved 23 January 2012. ^ "An Inside Look at DisplayPort v1.2". ExtremeTech. 4 February 2011. Retrieved 28 July 2011. ^ "The Case For DisplayPort, Continued, And Bezels". Tom's Hardware. 15 April 2010. Retrieved 28 July 2011. ^ "DisplayPort… the End of an Era, but Beginning of a New Age". Hope Industrial Systems. 27 April 2011. Retrieved 9 March 2012. ^ "New DisplayPort(TM) Interface Standard for PCs, Monitors, TV Displays and Projectors Released by the Video Electronics Standards Association". Video Electronics Standards Association (VESA). 3 May 2006. Archived from the original on 14 February 2009. ^ Hodgin, Rick (30 July 2007). "DisplayPort: The new video interconnect standard". geek.com. Retrieved 21 July 2011. ^ a b c d e f g h i j k l m n o p q r s t u v w x y z aa ab ac "VESA DisplayPort Standard, Version 1, Revision 1a" (PDF). Video Electronics Standards Association (VESA). 11 January 2008. Archived from the original (PDF) on 8 April 2016. ^ "Video Electronics Standards Association (VESA) Endorses Alternative to Copper Cables". Luxtera Inc. 17 April 2007. Archived from the original on 18 February 2010. Retrieved 19 January 2010. ^ "Free Standards". Video Electronics Standards Association (VESA). Retrieved 2 May 2018. ^ a b "VESA® Introduces DisplayPort® v1.2, the Most Comprehensive and Innovative Display Interface Available". www.vesa.org. Video Electronics Standards Association (VESA). 7 January 2010. Archived from the original on 2 May 2018. Retrieved 2 May 2018. ^ a b c d e "DisplayPort Developer Conference Presentations Posted". Vesa. ^ "WinHEC 2008 GRA-583: Display Technologies". Microsoft. 6 November 2008. Archived from the original on 27 December 2008. ^ Joseph D. Cornwall (15 January 2014). "DisplayPort in A/V Applications in the Next Five Years". connectorsupplier.com. Retrieved 10 May 2018. ^ "VESA® Adds 'Adaptive-Sync' to Popular DisplayPort™ Video Standard". vesa.org. Retrieved 27 January 2016. ^ Anand Lal Shimpi. "AMD Demonstrates "FreeSync", Free G-Sync Alternative, at CES 2014". anandtech.com. Retrieved 27 January 2016. ^ "AMD 'FreeSync': proposition pour le DP 1.2a". hardware.fr. Retrieved 27 January 2016. ^ a b c d e "VESA Releases DisplayPort™ 1.3 Standard". Video Electronics Standards Association (VESA). 15 September 2014. Archived from the original on 12 August 2017. Retrieved 27 January 2016. ^ "VESA Releases DisplayPort 1.3 Standard: 50% More Bandwidth, New Features". www.anandtech.com. Retrieved 7 January 2016. ^ "VESA Releases DisplayPort 1.3 Standard: 50% More Bandwidth, New Features". 16 September 2014. Retrieved 15 September 2016. DisplayPort Active-Sync remains an optional part of the specification, so Adaptive-Sync availability will continue to be on a monitor-by-monitor basis as a premium feature. ^ a b c d e "VESA Publishes DisplayPort™ Standard Version 1.4". Video Electronics Standards Association (VESA). 1 March 2016. Archived from the original on 3 January 2018. Retrieved 2 March 2016. ^ "DisplayPort 1.4 vs HDMI 2.1". Planar. ^ "Next DisplayPort Can Drive 8K HDR Monitors". NextPowerUp. Retrieved 4 March 2016. ^ a b "FAQ - DisplayPort". Archived from the original on 24 December 2018. ^ "VESA DisplayPort Alternate Mode on USB-C - Technical Overview" (PDF). USB Implementers Forum. 28 September 2016. ^ "VESA Strengthens 8K Video Resolution Ecosystem with Market-ready DP8K Certified DisplayPort Cables". VESA - Interface Standards for The Display Industry. 3 January 2018. ^ Sag, Anshel (12 February 2019). "Display Technologies Ruled At CES 2019". Forbes.com. Retrieved 12 April 2019. ^ Kowaliski, Cyril (4 May 2006). "DisplayPort 1.0 approved by VESA". www.techreport.com. The Tech Report. Retrieved 1 May 2018. ^ a b "MPEG LA Expands DisplayPort License Coverage" (PDF). 8 August 2016. Retrieved 2 May 2018. ^ Syed Athar Hussain (June 2016). "DisplayPort — Future Proofing Display Connectivity for VR and 8K HDR" (PDF). Retrieved 11 May 2018. ^ "Thunderbolt 3 Technology Brief" (PDF). Intel Corporation. 2016. Retrieved 14 May 2018. ^ a b c Craig Wiley (25 April 2013). "How to Choose a DisplayPort Cable, and Not Get a Bad One!". DisplayPort.org. Archived from the original on 5 July 2013. ^ "VESA Strengthens 8K Video Resolution Ecosystem with Market-ready DP8K Certified DisplayPort Cables". Video Electronics Standards Association (VESA). 3 January 2018. Archived from the original on 14 May 2018. Retrieved 14 May 2018. ^ a b "Mini DisplayPort Connector Standard, Version 1.0" (PDF). Video Electronics Standards Association (VESA). 26 October 2009. Retrieved 13 May 2018. ^ "The DisplayPort Pin 20 Problem". Monitor Insider. Archived from the original on 14 May 2018. Retrieved 14 May 2018. ^ Roy Santos (3 January 2008). "Dell UltraSharp 3008WFP 30-Inch LCD Monitor". PC World. Archived from the original on 23 March 2018. Retrieved 14 May 2018. ^ "DisplayPort Marketing Guidelines R14" (PDF). 8 June 2018. Archived from the original (PDF) on 24 March 2019. ^ "GTX 770 4gb Unable to select 144hz on dell S2716DG". ^ "LG 27UK650-W 4K UHD LED Monitor". Archived from the original on 18 November 2018. ^ "VESA Introduces Updated Dual-Mode Standard for Higher Resolution Interoperability with HDMI Displays". VESA. 31 January 2013. Archived from the original on 10 May 2018. Retrieved 13 May 2018. ^ "DisplayPortTM Ver.1.2 Overview" (PDF). Retrieved 5 July 2018. ^ "Display Daisy-Chaining with High Sierra". 27 September 2017. Archived from the original on 13 May 2018. Retrieved 13 May 2018. ^ "MBPr 2015, 2.5GHz i7 – Daisychaining 2 Dell U2414H 61 Screens". 31 May 2015. Archived from the original on 7 December 2016. Retrieved 13 May 2018. ^ "Google's USB Type-C to DP Adapter "DingDong"". Retrieved 2 August 2018. ^ "MPEG LA Introduces License for DisplayPort". Business Wire. 5 March 2015. Retrieved 5 March 2015. ^ "DisplayPort Attachment 1" (PDF). 23 November 2015. Retrieved 23 November 2015. ^ "DisplayPort FAQ". Video Electronics Standards Association (VESA). Archived from the original on 13 November 2015. Retrieved 23 November 2015. ^ "VESA standards purchasing page". ^ a b "VGA Given 5 Years to Live". Tech news world. 9 December 2010. ^ "Top PC, Chip, Display Makers to Ditch VGA, DVI". PCMag. ^ "Standards". Vesa. Retrieved 27 January 2016. ^ Niels Broekhuijsen. "EVGA's DisplayPort Hub Available Now". Tomshardware.com. Retrieved 7 March 2014. ^ Moritz Förster (16 September 2014). "VESA veröffentlicht DisplayPort 1.3". heise online. Retrieved 27 January 2016. ^ "FAQ Archive - DisplayPort". VESA. Retrieved 22 August 2012. ^ "The Truth About DisplayPort vs. HDMI". dell.com. Retrieved 27 January 2016. ^ "HDMI Adopter Terms". HDMI. Retrieved 23 June 2008. ^ "Interview with Steve Venuti from HDMI Licensing" (PDF). HDMI Licensing. Retrieved 27 January 2016. ^ "Zotac releases DisplayPort to dual HDMI adapter". Anandtech. 2 August 2011. Retrieved 23 January 2012. ^ "FAQ for HDMI 2.0". HDMI. Retrieved 29 November 2013. ^ "HDMI Specification 1.3a" (PDF). HDMI Licensing, LLC. 10 November 2006. Retrieved 1 April 2016. ^ Hans Verkuil (20 November 2017). "Linux drm: add support for DisplayPort CEC-Tunneling-over-AUX". Cisco. Retrieved 3 January 2018. ^ "Digitimes Research: Proportion of HDMI/DisplayPort technology in LCD monitors increases 7.5pp in August". DIGITIMES. ^ "DisplayPort expected to surpass HDMI in 2019 - IHS Technology". technology.ihs.com. ^ "Thunderbolt Technology: The Fastest Data Connection to Your PC Just Arrived" (Press release). Intel. 24 February 2011. Retrieved 24 February 2011. ^ "VESA Begins Development of micro-DisplayPort Connector Standard". DisplayPort. 23 October 2013. Retrieved 7 March 2014. ^ VESA, displayport. "FAQ". displayport.org. VESA. Retrieved 12 August 2017. ^ "VESA Finalizes Requirements for Display Stream Compression Standard" (Press release). VESA. 24 January 2013. ^ "HDMI Forum announces version 2.1 of the HDMI specification". HDMI.org. 4 January 2017. Retrieved 10 January 2017. ^ "Introducing HDMI 2.1". HDMI.org. Retrieved 10 January 2017. ^ Anton Shilov (5 January 2017). "HDMI 2.1 Announced". Anandtech. Retrieved 10 January 2017. ^ "Embedded DisplayPort Standard Ready from VESA" (PDF). VESA. 23 February 2009. Archived from the original (PDF) on 7 July 2012. ^ "VESA Issues Updated Embedded DisplayPort Standard". Business Wire. Retrieved 27 January 2016. ^ "Mobile Battery Life and Display Performance Improves with Upcoming Release of eDP 1.4". VESA. 10 September 2012. Retrieved 10 November 2013. ^ "VESA Publishes Embedded DisplayPort (eDP) Standard Version 1.4a". vesa.org. Retrieved 27 January 2016. ^ "VESA Rolls Out Production-Ready Embedded DisplayPort Standard 1.4 for Mobile Personal Computing Devices". VESA. 27 October 2015. Retrieved 28 October 2015. ^ "VESA Issues Internal DisplayPort Standard for Flat Panel TVs" (PDF). VESA. 10 May 2010. Archived from the original (PDF) on 26 July 2011. ^ "VESA Experiences Acceleration of MyDP Standard Adoption in Mobile Devices". ^ "Support - Slimport". Us.slimportconnect.com. 18 July 2013. Retrieved 11 March 2014. ^ "Releases MyDP Standard". VESA. 27 June 2012. Retrieved 10 November 2013. ^ "Experiences Acceleration of MyDP Standard Adoption in Mobile Devices". VESA. 9 November 2012. Retrieved 10 November 2013. ^ "Hands on with the Analogix SlimPort microUSB to HDMI and VGA adapters". AnandTech. Retrieved 31 December 2013. ^ "SlimPort". SlimPort. Retrieved 31 December 2013. ^ "VESA Refreshes DisplayID Standard to Support Higher Resolutions and Tiled Displays". vesa.org. 23 September 2013. Retrieved 24 December 2013. ^ "Gaming At 3840x2160: Is Your PC Ready For A 4K Display?". www.tomshardware.com. 19 September 2013. Retrieved 26 December 2013. ^ "MD/TI's DockPort Adopted As Official Extension to DisplayPort Standard". anandtech.com. Retrieved 12 January 2014. ^ "DisplayPort Alternate Mode for USB Type-C Announced - Video, Power, & Data All Over Type-D". anandtech.com. Retrieved 14 October 2014. ^ "Dell UltraSharp 3008WFP 30-Inch LCD Monitor". The Washington Post. Retrieved 25 June 2008. ^ "AMD Receives First Ever DisplayPort™ Certification for PC Graphics". AMD. 19 March 2008. Retrieved 23 January 2012. ^ Kirsch, Nathan (21 February 2008). "EVGA, Palit and XFX GeForce 9600 GT Video Card Review". Legit Reviews. Retrieved 2 April 2013. ^ "Software Licensing and Trademark Agreement: Mini DisplayPort". ^ "Apple Mini DisplayPort Connector Implementation License Checklist" (PDF). Apple. Retrieved 4 December 2008. ^ "ATI Radeon HD 5870 1GB Graphics Card and AMD Eyefinity Review". PC Perspective. 23 September 2009. Archived from the original on 27 September 2009. Retrieved 23 September 2009. ^ "Signs of the Times: Massive Digital Signage Displays Powered by Diminutive Graphics Card". The Official NVIDIA Blog. Retrieved 27 January 2016. ^ "Radeon™ RX 480-Grafikkarten - AMD". www.amd.com. ^ "Analogix announces DisplayPort transmitter". 26 August 2006. Archived from the original on 24 June 2013. Retrieved 10 August 2009 . ^ "Genesis Microchip (GNSS) Q4 2006 Earnings Conference Call". Seeking Alpha. 2 May 2006. Retrieved 16 July 2007. ^ "Samsung touts development of first DisplayPort desktop LCD". TG Daily. 25 July 2006. Archived from the original on 26 September 2007. Retrieved 25 July 2007. ^ "Worldwide First DisplayPort MB". 25 March 2008. Archived from the original on 15 January 2009. Retrieved 10 August 2009. ^ "MSI announces video adaptor with DisplayPort". 17 January 2008. Archived from the original on 19 December 2013. Retrieved 10 August 2009.